It has been awhile since I've done a "I really love my.... " post so let's jump back in by talking about my favorite neutral: LEOPARD. As far as Jenna Lyons is concerned, leopard is a neutral and that's authority enough for me. So I encourage you to embrace leopard as your favorite neutral and new best friend this fall. Going with this idea that leopard is a neutral, the print is the perfect print to dip your toes in to the world of pattern mixing. Style tip #1: Small accents are easy. Use a belt, heels or a scarf to add a new pattern but not to overwhelm your look. A small accent is an easy place to start. Style tip #2: Stripes are a safe bet. Leopard and stripes go hand in hand. Start with something that matches the brown of the leopard easily like navy or black or dive right into reds, orange and pinks. Because the patterns are so different, stripes of almost any matching color will compliment nicely. 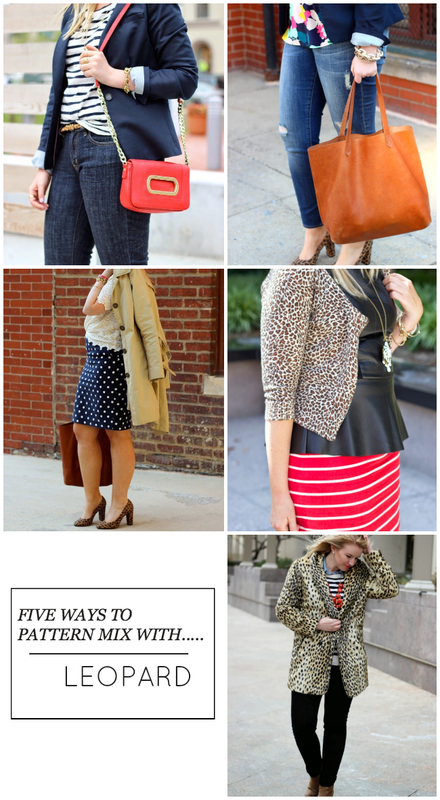 Style tip #3 Keep the spots small. Pattern mixing works best when the patterns are different sizes so that one pattern become the focus. Leopard print with small spots works so well because it automatically becomes the secondary pattern which allows you to wear it with bigger camo or floral prints. What do you think about pattern mixing? You into it? Or is it too busy for you? PS- I'm linking up with Lauren today!